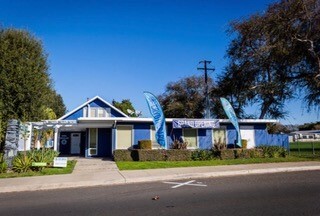 Norma Amezcua, owner of a cryotherapy wellness clinic named Cool Indulge, purchased the property located at 1023 E Chapman Avenue in Fullerton, CA. TMC Financing worked with Norma to secure financing by utilizing the SBA 504 Program, which allowed Norma to make the purchase with a low down payment and a below market, fixed interest rate, fully amortized over 20 years. This real-estate purchase not only gave Cool Indulge the security of long-term stability, but also allowed Norma the freedom to make improvements and design her space exactly as she saw fit. I am so glad that I chose TMC to help guide me through the 504 loan process. They were organized and available when I needed them. Not only did they help me finance my building purchase but they helped me finance my dream. Cool Indulge offers an alternative all-natural approach to health & fitness. It implements various recovery techniques such as Cryotherapy, Celluma Light Therapy, Compression Pants and Epigenetic Mapping. For Norma, the vision of owning and operating her own clinic stemmed from her own personal wellness journey. Conventional treatments continuously failed to meet her needs. As a result, Norma studied alternative means of recovery, and incorporated them into her business practice. With so much emphasis on making her clients feel secure, Norma knew that she didn’t want to run her business in leased space. She realized that purchasing a building was the optimal way to create that foundation of stability for Cool Indulge and trust for her clients. Despite Cool Indulge’s loyal following and thriving business, Norma knew that she could not sustain success without the long-term stability and flexibility of owning her building. “I wanted to control a client’s first impression of my business by creating the most welcoming atmosphere. I wanted to furnish my clinic in way that is inviting and nurturing, and I didn’t want to have to get approval from a landlord to do so,” stated Norma. TMC’s Senior Vice President of Business Development, Jennifer Davis, explained to Norma that the 504 program is the best way for to stabilize occupancy costs and put the business owner in control. “The SBA 504 Loan is one of the soundest financing options available for strategic small business expansion, which is why it was an excellent option for Cool Indulge at this crucial stage in their growth cycle,” according to Jennifer. “I am so glad that I chose TMC to help guide me through the 504 loan process. They were organized and available when I needed them. Not only did they help me finance my building purchase but they helped me finance my dream,” said Norma.